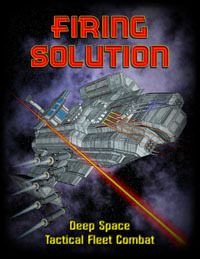 # Space combat your way... In two or three dimensions on hex grids or measured using any flat playing surface, all without complicated rules or math. # Easily field fleets of ships in battle using any of the 30+ included ships or quickly design your own using the included construction rules. # Damage types and defenses use a rock / paper / scissors approach with each damage type having an appropriate defense. Empires may specialize in particular technologies but no single vessel can excel at everything. # Tactical Data Link squadrons, Escorts, other special equipment and ship orders add considerable depth to fleet tactics. # Command an empire in its struggle for galactic dominance with the included campaign system based on colony control and infrastructure. # The combination of ship elevation and roll status with directional defenses, individual weapon firing arcs and dorsal, ventral or spinal mounting options bring 3D battlefields to life without vectors or other complex math. # Enhance weapons by adding various weapon effects such as barrage, slow arming or spinal mount to alter their capabilities. # Unique damage system scales the severity of each weapon attack allowing larger vessels to dispatch small ships more easily while smaller vessels need to wear down larger targets with repeated strikes. # Use one of the four included Empires or create your own using a simple system allowing the creation of empires tailored to your favorite setting.